A lot of geologic knowledge is gleaned from roadcuts. 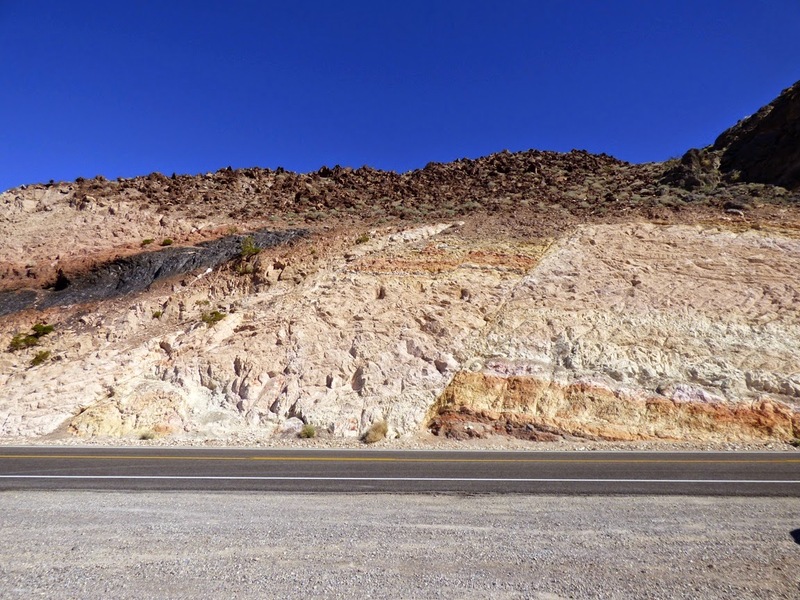 In less arid regions, vegetation and soil cover is so thick that roadcuts provide essentially the only information about the underlying geology. That isn't as much of a problem in the Basin and Range Province of Nevada, eastern California, and western Utah. It's a dry land, and the rocks stand out in bold relief. And with flat valley floors, roads don't need to be carved through solid rock all that often. But sometimes roads have to cross the mountain ranges, and there they are. A peek at the interior of a mountain range. 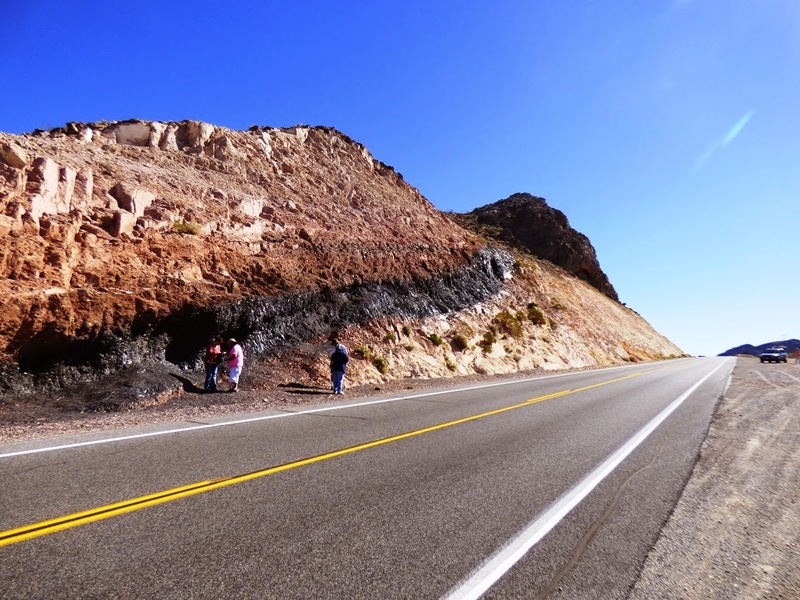 Some outcrops are more instructive than others, and once in a while, a road crew uncovers something spectacular. 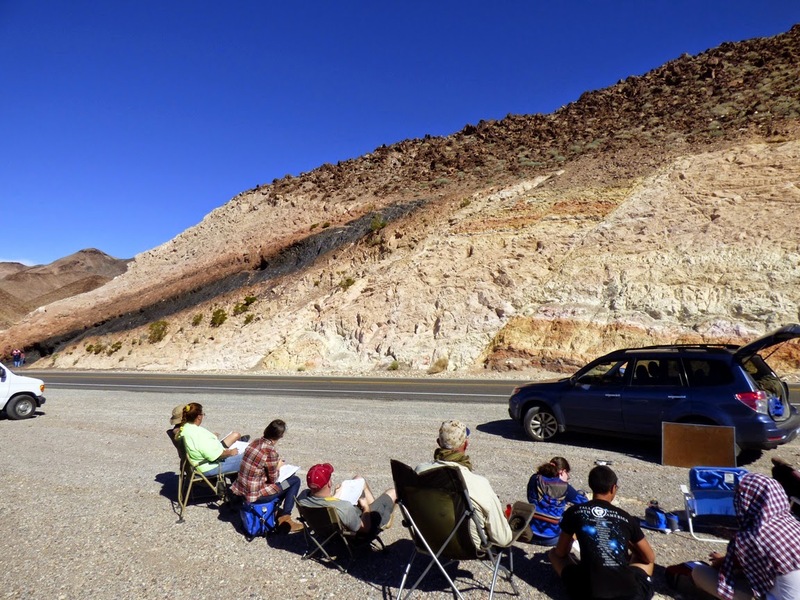 That's what happened when Highway 178, the Charles Brown Highway, was constructed over the Resting Springs Range from Shoshone, California to Pahrump, Nevada. It's about three or four miles east of Shoshone, and you can hardly miss it. 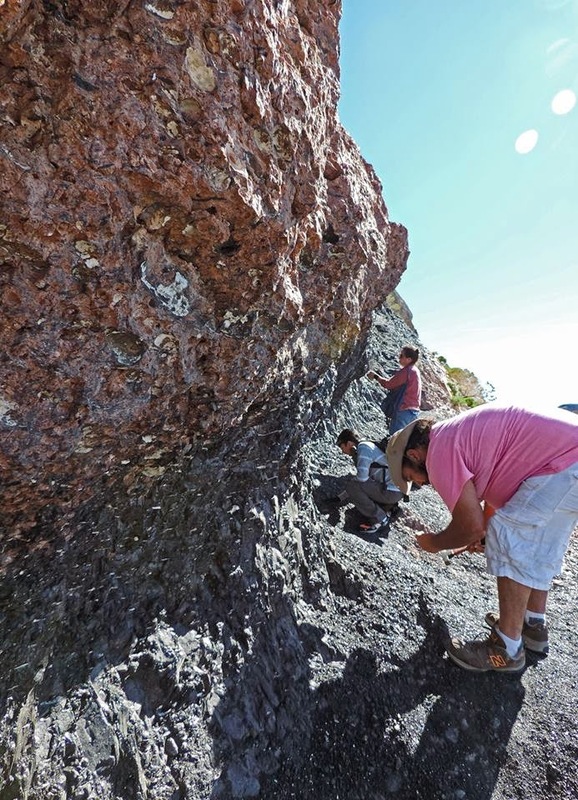 There is a huge black "thing" climbing the slope that grabs your attention, and brings any geologist's foot down on the brakes. Caltrans has kindly provided a wide turnout, no doubt because of the congestion that occurs here during field studies season. 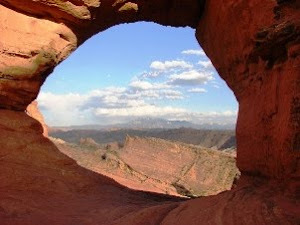 The view from the pullout takes in a broken land, as Professor Frank DeCourten has called it. The tan hills of the Resting Spring Range lie in foreground. 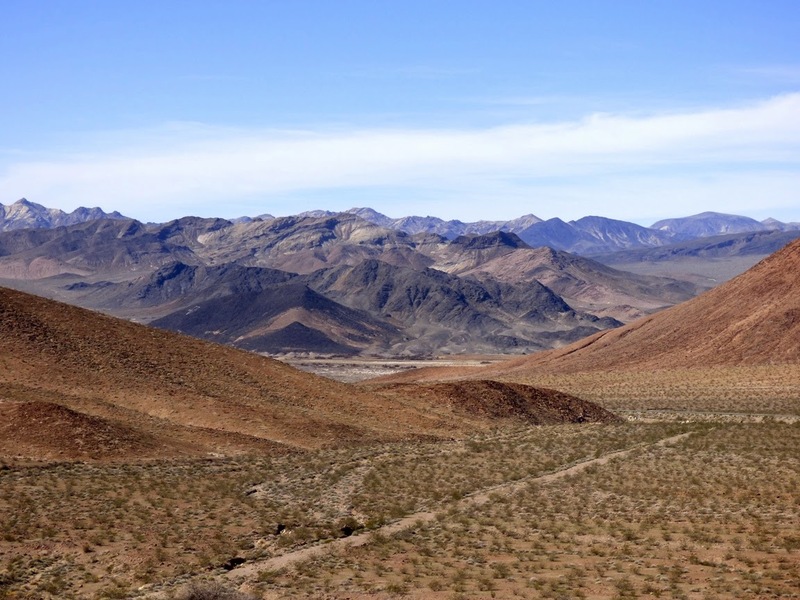 Across the Amargosa "River" Valley is another ridge of twisted and broken rock, the Amargosa Range, then the Greenwaters, and on the skyline, the Black Mountains. Beyond lies the deep trough of Death Valley. This is a land with a violent history that has included dozens, if not hundreds of astoundingly huge volcanic eruptions, any one of which, if they happened today, could bring about the end of human civilization (through the disruption of agricultural production). The land was stretched until the crust snapped and huge fault systems developed, with deep fault valleys (grabens) and high mountain ranges (horsts). Whatever river systems existed were disrupted (one of them may have been the ancestral Colorado River). Today, even if there were water to flow, none would flow to the sea. The rivers would end in the adjacent valley, forming large lakes. The Charlie Brown Outcrop, as it is informally known, encapsulates many elements of the story. There are really three stories told in this exposure, that of distant ash eruptions, a violent eruption close by, and earthquakes with associated mountain-building. Distant ash explosions sent clouds of pulverized pumice shards that landed in lake beds and valley bottoms. The exposures took various hues due to oxidation of metals, mostly iron, in the ash beds. When major fault systems broke up the landscape, many smaller subsidiary faults shifted a few inches or feet. The ash beds and faults are nicely exposed on the right side of the outcrop. Pictures of this fault grace many geology textbooks. The dark layer also tells of violent events. A nearby ash eruption produced very hot clouds of incandescent rock particles that landed in a thick layer, and remelted. Such rocks are called welded tuff or ignimbrite. The black layer is the most completely melted rock, and is called a vitrophyre. In essence it is obsidian, but not of a quality that one would want to make arrowheads with. It's all quite a puzzle for our field students who are seeing these kinds of features for the first time. We introduce the classification of faults, talk a bit about pyroclastic rocks, and then they sketch out the relationships that they can see. They give their best interpretation of what happened here, and the nice thing is, a lot of them find out that they can do a pretty fair job of discerning the story revealed by the rocks. 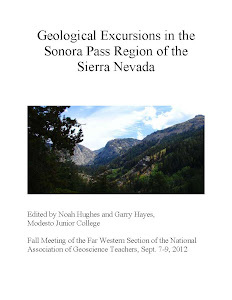 Troxel, B. W., and Heydari, E., 1982, Basin and Range geology in a road cut, in Cooper, J. D., Troxel, B. W., and Wright, L. A., eds., Geology of selected areas in the San Bernardino Mountains, western Mojave Desert and southern Great Basin, California: Geological Society of America, Guidebook, p. 91 – 96.